On August 31, 1915, a Texas posse lynched five "horse thieves." One of them, it turned out, was General Pascual Orozco Jr., military hero of the Mexican Revolution. Was he a desperado or a hero? Orozco's death proved as controversial as his storied life, a career of mysterious contradictions that Raymond Caballero puzzles out in this book. 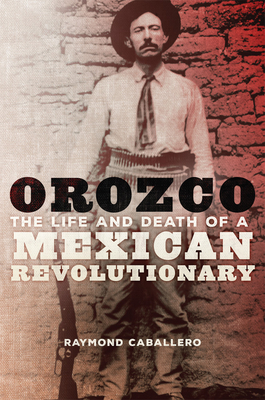 A long-overdue biography of a significant but little-known and less understood figure of Mexican history, Orozco tells the full story of this revolutionary's meteoric rise and ignominious descent, including the purposely obscured circumstances of his death at the hands of a lone, murderous lawman. That story--of an unknown muleteer of Northwest Chihuahua who became the revolution's most important military leader, a national hero and idol, only to turn on his former revolutionary ally Francisco Madero--is one of the most compelling narratives of early-twentieth-century Mexican history. Without Orozco's leadership, Madero would likely have never deposed dictator Porfirio D az. And yet Orozco soon joined Madero's hated assassin, the new dictator, Victoriano Huerta, and espoused progressive reforms while fighting on behalf of reactionaries. Whereas other historians have struggled to make sense of this contradictory record, Caballero brings to light Orozco's bizarre appointment of an unknown con man to administer his rebellion, a man whose background and character, once revealed, explain many of Orozco's previously baffling actions. The book also delves into the peculiar history of Orozco's homeland, offering new insight into why Northwest Chihuahua, of all places in Mexico, produced the revolution's military leadership, in particular a champion like Pascual Orozco. From the circumstances of his ascent, to revelations about his treachery, to the true details of his death, Orozco at last emerges, through Caballero's account, in all his complexity and significance.